Big hands to be exact. Ones that belong to towering wideout Juwan Johnson. The two players are roommate during training camp, and it's safe to say that the Nittany Lions' tallest receiving duo is getting along just fine in those close quarters. "Me and Justin have a great rapport," Johnson said after practice on Wednesday evening. "It's going to take him a little while to settle down and get into college and learn the plays and do the things he has to do." That's good news for Penn State too as Shorter brings in a frame that is very opposite of his name at 6-foot-4 and a physical stature that makes him look more than a sophomore or junior than an newcomer. "Justin's Justin," Strength coach Dwight Galt said this Spring. "He was the best receiver in the country coming out by some prognosticators. And we didn't have as much time with him — we had one week with him — but that's when it helps to have Juwan Johnson here. Because Justin walks in and he's like a 226, 6-foot-4, 4.4 guy and he turns around and stares at Juwan Johnson, who's 6-foot-5, 230 has got some good stuff happening." As far as Johnson is concerned, he's paying it forward, and if the trend is any indication Shorter ought to be the latest in a growing lineage of talented and impactful Penn State receivers to room together. It wasn't too long ago Johnson was bunking up with now Tampa Bay Buccaneers receiver Chris Godwin. "Chris was my roommate when i got here and helped turn me into the player I am" Johnson added. "And obviously he's doing well with the Bucs right now. He and I hit it off right away." Of course Johnson isn't the only veteran in a receiver room that has been on the other end of so many long Trace McSorley passes. Now it's up to them to get the rest of the guys ready, a young crew of targets that include speedster KJ Hamler, Mac Hippenhammer and Johan Dotson. 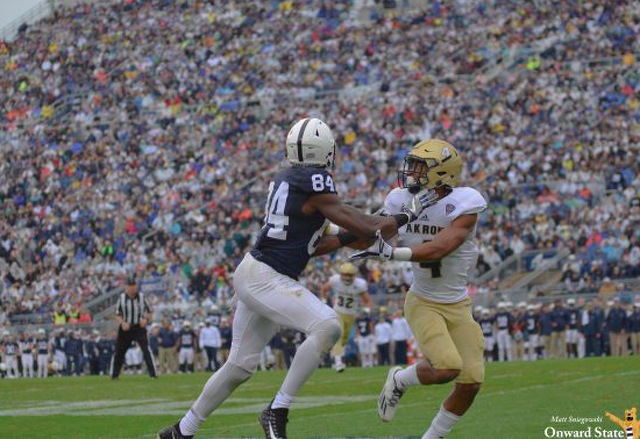 "Me and DeAndre (Thompkins) are the older guys in the room and we try and do a great job of bringing those younger guys under our wing and keep their head on straight and show them what it means to be a receiver here at Penn State." Johnson added. Who gets to hear you snore doesn't dictate how your season will go, but any late night football talk between Shorter and Johnson will almost certainly benefit the Nittany Lions in the long run. Perhaps most importantly, the guy throwing the passes is impressed too. "Justin's a dude who all through the spring was texting me, asking when he could get the playbook and watch film," Trace McSorley added. "And physically, when he walks in the room, he doesn't look like an 18-year-old kid." "You see him open up and run and he's a good looking receiver. He's a kid that I think if he keeps improving he can get a shot this year."